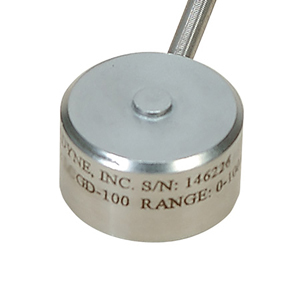 The LCGD Series miniature low profile load cells are compression load cells with excellent long term stability. An all stainless steel construction assures reliability in severe industrial environments and a 5-pt NIST traceable calibration is included with each load cell. These units are designed to operate by mounting on a flat surface, and they have a load button machined as an integral part of the basic load cell. The LCGD is also available in metric configurations, with ranges from 0-100 N to 0-200kN. Please see the LCMGD for complete details, or contact our Pressure department for more information..